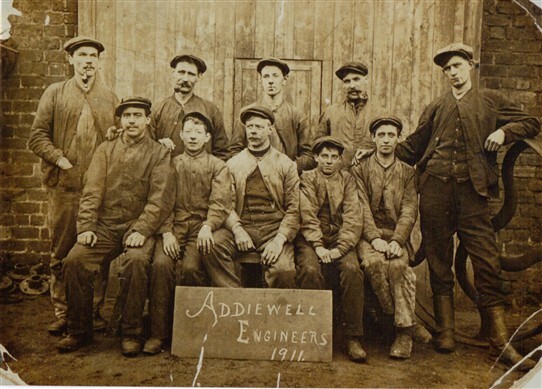 My grandfather Thomas Young started his working life as an apprentice at Addiewell Engineers. In 1911 he appeared on a photograph - taken in the same place as the 1900 one, alongside many of the same men! He is the smallest one sitting on the front row and was 14 or 15. I never met him as he died in 1954, but he moved with his wife and 5 children to Nottingham (where all his descendants still live) around 1932 to work in the coalmines. This page was added by Melanie Thompson on 23/08/2013.